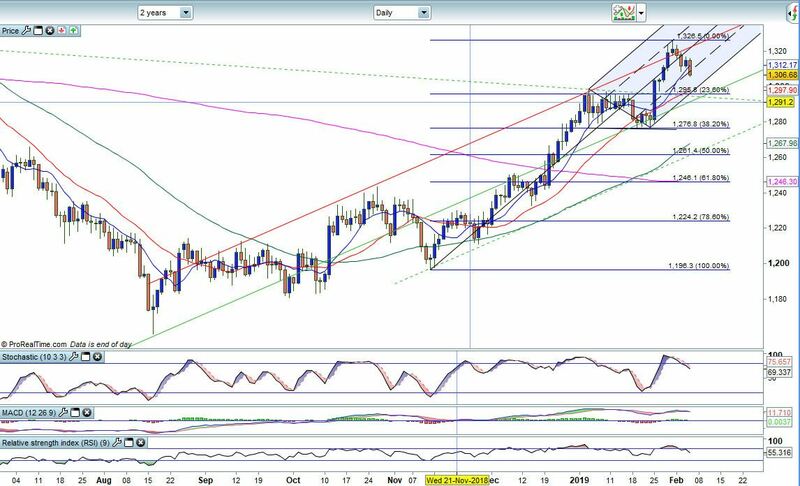 So last night we broke my key 1308 level and therefore I cut my long Gold position...I still think Gold is a buy at lower levels...but it was obviously a turning point for me was the break of 1308...Now what...well the market has eased its overbought conditions that we saw up at 1326...and now we are at neutral levels...although still currently pointing lower... We do have support in the 1032 region...but we have more support down at 1298/97..We have our longer term 23.6 fib coming in at 1295....and I think this will be the testing area.. If we can maintain above here...thus easing the stochastics and other indicators further...I think that buyers would be looking to get back into Gold.. We know usually it's the first week or 2 when the $ gets perky....It usually sorts itself out however after that...So as the $ is looking a lot better in the last 10 days...It is really a case of hanging on in there...and looking to see what else is happening around...The state of the Aussie $ hasn't helped Gold either...Aussie has been hit badly...and so has the Kiwi....although this cross pain is showing Aussie weakness more..... So just look at the levels...See if the major one holds...If it doesn't we short Gold and we would then ben looing for a move lower which is down to 1288/87 short term...but could extend lower to 1276...I really at this point do not see this scenario being taken...but I have to write as I see it...I still think Gold has value at lower levels...although we do know that God can crash when it wants to 2011 and 2016 was that point...Also we know that even above 1326...there is a major selling area in the 1365/985 region...and I really do not see that being taken out. The research provided by Charmer Charts is provided solely to enable clients to make their own investment decisions and does not constitute personal investment recommendations. No recommendations are made directly or indirectly by Technicalanalysisreports.com or Charmer Charts as to the merits or suitability of any investment decision or transaction that may result directly or indirectly from having viewed the technical analysis investment research. Customers are therefore urged to seek independent financial advice if they are in any doubt. The value of investments and the income derived from them can go down as well as up, and you may not get back the full amount you originally invested. Derivatives and foreign exchange trading are particularly high-risk, high-reward investment instruments and an investor may lose some or all of his or her original investment. Also, if you decide to acquire any investment denominated in a different currency you should note that changes in foreign exchange rates may have an adverse effect on the value, price and income of the investment in your own currency. Technicalanalysisreports.com or Charmer Charts shall not be liable for any direct or indirect, incidental or consequential loss or damage (including loss of profits, revenue or goodwill) arising from the use, inability to use, interruption or non-availability of the technical analysis investment research or any part of the research materials published or otherwise any loss of data on transmission, howsoever caused. Whilst the research material published is believed to be reliable and accurate, it is not independently verified. Accordingly, no representation or warranty is made or given by Technicalanalysisreports.com or Charmer Charts, its officers, agents or employees as to the accuracy or completeness of the same and no such person shall have liability for any inaccuracy in, or omission from, such materials.